Specifications:Size: Dcapacity: 8500 Mah Chemistry: Nickel Metal Hydride (Nimh)Voltage: 1.2V Brand: Accupowerincluded Qty: 1Features:No Memory Effectreliable Service Life Long-Lasting Performancelow Self Dischargehigh Discharge Raterecharges Up To 1000 Cyclessaves You Hundreds Of Dollars Compared To Alkaline Batteriescan Be Replaced In Any Product That Uses D Batteries . 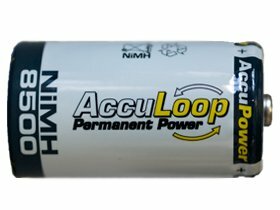 If you have any questions about this product by AccuPower, contact us by completing and submitting the form below. If you are looking for a specif part number, please include it with your message.